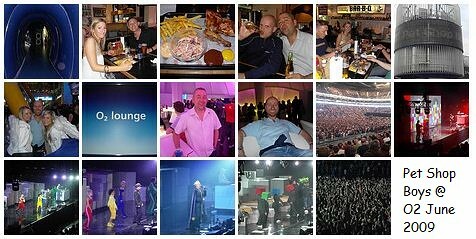 On Friday night Clodagh, Colin, Charlie, Paul, Simon, Darren, Stu and I all went along to the O2 Arena to watch the Pet Shop Boys's sell-out Pandemonium tour. We had a a rare old time - not least because Paul and I had VIP passes (hic). The PSBs were good, as ever. The usual mix of dance, relentlessly cubist visuals and mashing up of songs old and new.